Phillip Island has located Victoria, 90 km from Melbourne. Phillip Island is one of the top most visited place to see the parade of the cute little penguins also called as Fairy penguins. Here you can find them wandering and spot them when they move to their burrows or any other hiding spots on land. Phillip Island draws thousands of visitors every year to see the little flightless bird waddling across the ocean. It is one of the places which has the largest number of little penguins’ colony. 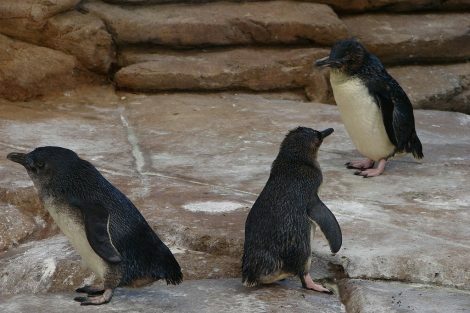 There is a list of tour packages to see the little penguins in the Phillip Island. The tour packages include underground viewing, penguin VIP tour, behind the scenes tour, and more. SEA LIFE: Sea life is serving as the best colony for little penguins. You can find many little penguins in the water and also some little baby penguins on the land in their hiding spots. Shore Beach: Same as in Lion Island you will feel luckier if at all you can see the little penguins waddling. The numbers have declined because of the environmental changes. Penguin Island is 45 minutes’ drive from the South of Perth. It is embraced with the white sand and crystal clear water holding all natures’ beauty. In this island you can get to see the little penguins closer at your looks. You can go there easily with the ferries and also you might witness rare Australian sea lions. Sea world is present in the Gold Coast where you can see the beautiful King penguins in the icy land. You can get to see the penguins playing and being on the chilling land with all their humble beauty. During the feeding time you can enjoy the sight of this spectacular creature more certainly. Kangaroo Island is one of the nicest colony of little penguins. You can watch the cute little fairy penguins waddling near the marine. You can probably find the groups or single penguins every few minutes. You can hear the noise of the little penguins which may be surprising for their size. King Island is in the Bass Strait in the state Tasmania. This Island is the biggest of the three islands in the Bass Strait. This Island is also well-known for the tallest granite lighthouse which is the largest tower in Australia. The island consists of a lot of little penguin colonies not the king penguin’s group. The island’s land is filled with grass surfaces. The little penguins of this island may hide under the car or wheel when parked. The threat faced by the little creatures on this island is much high. In this Island, you can see many little penguins and it has the population of over 1000 numbers of this adorable little creature. The little penguins in this island are little different from the ones in the Phillip Island. They make their nests behind rocks rather than making burrows in the sand. The best time to see the penguins’ parade is during the sunset time. The most commonly found penguins in Australia are the little penguins. The king penguins are found only in the SEA WORLD, Queensland. The little penguins have set their colonies on the coast in large numbers, some found declined in recent days. But, thanks to the conservational steps that protects and saves the little bowling pin resembling an adorable creature. The Kangaroo Island is one of the rarest places where the little penguin groups from east and west associate. The little penguins are 33cm tall and weigh around 1 kg. The males are a little heavier than the females. You can see most of them in the early evening and enjoy the spectacle of the little penguins dipping from the ocean and crossing the beach. The little penguins live maximum time swimming in the sea. The matured little penguins have blue and white feathers. This color is discrete from the other penguins that usually have black and white feathers. There is some understanding that Australian and New Zealand penguins have commonness, but that is not the fact- Australian and New Zealand penguins are different species genetically. Also, there is a common question when you witness the little penguins, whether these little birds fly? Certainly, they cannot fly, the little penguins are the species from flightless penguin’s family. While seeing the parade of the little penguins in the Australian ocean try not to take photos with the flashlight ON. The light from the camera might cause some disturbances to the endearing flightless birds. When our eyes look at the innocent little penguins, it makes us happy and also fears of endangers that they may face. There are many measures taken to safeguard the species. Whenever you visit the Islands to see the penguins, check below the car and behind the wheels to rescue any penguins that hide there out of fear. Apart from the places mentioned above, there are a few more places where you would have heard from people that they have seen the penguins. Advised not to rely on and wait to check for the parade. Because, the penguins in those areas might not be frequent and that would have been a long wait to see, which may not be possible. Hope, this post has contributed to answering your search!